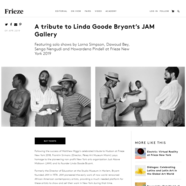 80 " x 47 5/8"
Michael Rosenfeld Gallery presents Norman Lewis: The Last Decade in Booth JAM3 as part of a curatorial focus on Just Above Midtown (JAM) and its founder Linda Goode Bryant by Franklin Sirmans (current director of the Pérez Art Museum Miami). Michael Rosenfeld Gallery’s solo presentation of the work of Norman Lewis (1909-1979) will feature paintings and works on paper created during the last decade of the artist’s life, reflecting two distinctive elements of Lewis’ abstract expressionist practice–calligraphic and atmospheric abstraction. A 1973 painting–one of two exhibited in the inaugural 1974 JAM exhibition Synthesis: A combination of parts or elements into a complex whole–will be on view in the booth, along with works from the same period that typify Lewis’ signature abstractions and masterful use of color, line and form. Michael Rosenfeld Gallery proudly represents the Estate of Norman Lewis and this exhibition has been organized with their cooperation.